Installation of multizone advertising audio system in sales area of supermarket Karavan in Zhytomyr. The system is built on the equipment of TOA (Japan) and JEDIA (Korea), worked well as a result of many years of service in various retail chains in Ukraine. The new system has significantly improved the quality of background music and advertisements, and also provided the opportunity to adjust the volume level of the zonal translation, which is useful in large salesrooms functionally separated by various shopping facilities and trade zones with different levels of ambient noise. 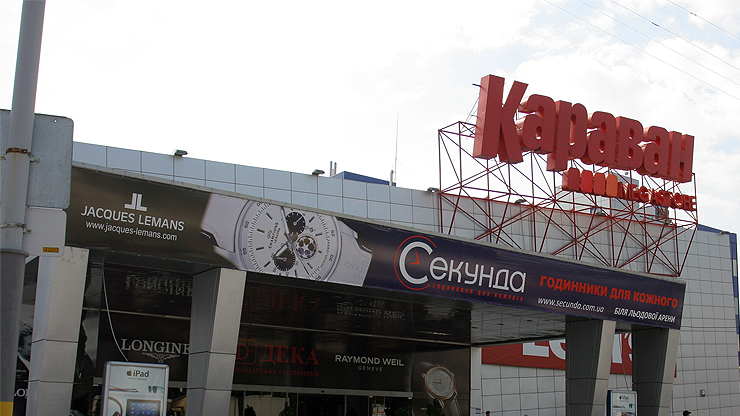 The project for the supply and installation of the system of advertising and background sound in shopping center Karavan in Kiev (Ukraine), Lugovaya st., 12. The aim of the project was to improve the quality of broadcast audio, elimination of noise and interference, which arose as a result of obsolete equipment. It was necessary to divide the total area of the shopping center in the area with the ability to adjust the level of the local broadcast sound. The installed sound system is designed for background music and advertisements, and consists of four zones controlled broadcast audio, microphone for announcements at the information desk and embedded in the ceiling and walls of speakers. This system also works in concert with the existing fire alarm, and case of alarm musical broadcast is interrupted. The project is carried out on the equipment of leading world manufacturers of TOA (Japan) and BOSCH (Germany).